The Otten’s reversible blades fit into three brackets framing its circular motor. These finely detailed brackets lend the Otten an industrial style and give its delicate lines a sense of weight. 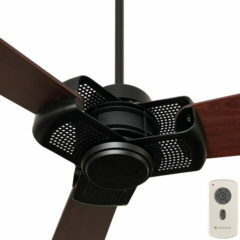 The fan’s large blade span (60 inches) and its high air flow capability (up to 12,223 m3/hr) put it in a class of its own.